The photograph above was taken in 2012. Number 6 Crispin Lane is the house on the right. Crispin Lodge is the house on the left and Crispin Cottage is the building at the far end of the yard. We have linked the history of these three houses because they were all built on a single plot of ground (known as Plot 229 at the time of the 1840 Tithe Survey). As the Tithe Map below on the right shows that the buildings on the plot at that time were different from those standing today, although it is possible that at least 6 Crispin Lane is formed from one of the buildings shown on the map. We haven’t yet seen the deeds of these properties, but in 2012 we came across an abstract of title dated 1883 which has told us something about the property’s early history. The two houses, now known as 4 and 6 Crispin Lane and the two other houses known as Crispin Lodge and Crispin Cottage were built on a single plot of land. The history of number 6 Crispin Lane as a separate property starts with John Goodenough Cossham. John Goodenough Cossham (the second) – was born on 30th May 1771 and baptised on 11th August 1771. He was the second child of John Goodenough Cossham and his wife, Mary (nee Pope) who had married on 6th November 1768. John became a carpenter. He married Anne Hill of Dursley at Thornbury on 22nd April 1792. They had nine daughters: Anne (probably Mary Anne Goodenough Cossham) born on 12th April 1793, Elizabeth born on 25th February 1796, Eliza born on 13th March 1798, Harriett born on 17th September 1800, Ann Goodenough born on 13th March 1804, Charlotte born on 24th April 1806, Emma born on 15th April 1808, Louisa born on 12th June 1811 and Hester baptised on 19th July 1814. Finally they had one son, John Goodenough Cossham baptised on 31st March 1816. On 13th April 1798 John arranged a mortgage of £196 with George Rolph. The 1883 Abstract mentions that John lived in the property after William Motley and that he had built a ‘small messuage or tenement then or then late in the occupation of Thomas Walker thatcher on the north east of the property where he lived. 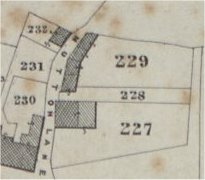 The land tax records of this period indicate that the property in which John had been living up to 1814 had been divided into two smaller properties by 1819. This presumably relates to the building of the new small house and the division of the garden. It is interesting however to note that although John continues to own and occupy one of the properties, in 1819 and 1821 the land tax records show the other is owned and occupied by Thomas Cossham, presumably John’s brother. John died aged 50 and was buried on 2nd August 1821. He did not leave a will, so the Abstract implies his property descended to his only son and heir, John Cossham Goodenough. The land tax records indicate that Ann continued to live in one of the properties, although the records are inconsistent as regards the owner of this property – some times it is Ann who is the owner and at other times it is Thomas who is the owner. The second property (the one consistently owned by Thomas) is let out to tenants: James Williams in 1822, Samuel Price in 1823 to 1827 and James Williams again 1828 to 1832. We assume that because John’s son was only about five when his father died, his inheritance was put into the trust of his mother and uncle until he came of age. We know from the 1840 Tithe Survey that at that time John jnr had assumed ownership although his mother was still alive. The 1841 census shows Ann was living at 9 Gloucester Road where she was described as a ‘workwoman’ aged 68. In the 1851 census she was living at either 33 or 35 St Mary Street. She was said to be a pauper in this record. Ann Cossham died aged 90 and was buried on 18th August 1858. Her address at the time of her death was at Morton. John Goodenough Cossham (the third) – was baptised on 31st March 1816, the 10th child, but first son of John Goodenough Cossham and his wife, Anne (see above). John was a blacksmith. On 8th November 1827 John transferred the mortgage (previously arranged by his father) to Thomas Crossman. The abstract shows that by this time John had built another messuage on the property. The 1840 Tithe Survey confirms that John owned three adjoining properties along the lane. Although the Tithe Survey shows John as occupying one of the three houses in Mutton Lane, we don’t know where John was living at the time of the 1841 census. The 1851 census shows John living with his mother, Ann, at 33 or 35 St Mary Street. John was a journeyman blacksmith unmarried and aged 34. Also living there were Ann’s grandchildren, George C Stagg, an errand boy aged 11 and Frances Stagg aged 3. The minutes of the Thornbury Baptist Church show that in November 1833 the mother of the two Stagg children referred to above, Elizabeth Stagg, had taken up abode with a young man, John Cossham, to whom she asserted she was married. The Minister checked and found no marriage had taken place and she was excluded from the Church for her fornication. On 13th April 1859 John sold the properties in Mutton Lane to Henry Knapp for £150, of which sum £140 had to be paid to Thomas Crossman to pay off the mortgage. The 1861 Census shows John was living in Mutton Lane at the home of his widowed sister, Mary Ann Savery who was a semptress aged 70. Mary Ann had married Joel Savery on 28th March 1824. The 1871 census shows John lodging in Gillingstool at the home of his sister, Charlotte and her husband, Richard Hatherell. John was described as an unmarried blacksmith aged 55. John died aged 63 and was buried on 4th April 1881. Robert died in 1896. The 1900 rate book shows that his trustees still owned the property and there were tenants listed in the three separate houses. Tucker Brothers – we had been told that 6 Crispin Lane had been built by the Tucker Brothers in 1902, but we feel it more likely that they re-developed the three houses which were previously on the site and that the present 6 Crispin Lane is substantially the same house which was there before. Certainly the rate books show that by 1905 the Tucker Brothers had acquired the property of Robert Sargent and that they had replaced two of the houses with stables and a coach-house. We are not sure when the Tuckers Brothers ceased operating. We understand that in the 1950’s Fred Day, who had been Mrs Mundy’s groom, kept a couple of hunter horses in the stables. In the early 1960s the outbuildings and yard were used as offices and storage yard by Thornbury Rural District Council engineering and drainage teams. They were let to Cotswold Treatment Ltd until 1991. In 1994 the property was sold by Julia Tucker (the widow of Ronald Tucker) to Anthony John Lewis and his wife, Pauline. Tragically, Anthony died before he was able to complete their ideas for converting the buildings for residential use. In 1995 the property was bought by Derrick Richard Hildresley who completed the task, creating Crispin Lodge and Crispin Cottage which now occupy the site.